To prevent rain over the roofless 91,000-seat Olympic stadium that Beijing natives have nicknamed the Bird’s Nest, the city’s branch of the national Weather Modification Office–itself a department of the larger China Meteorological Administration–has prepared a three-stage program for the 2008 Olympics this August. First, Beijing’s Weather Modification Office will track the region’s weather via satellites, planes, radar, and an IBM p575 supercomputer, purchased from Big Blue last year, that executes 9.8 trillion floating point operations per second. It models an area of 44,000 square kilometers (17,000 square miles) accurately enough to generate hourly forecasts for each kilometer. Then, using their two aircraft and an array of twenty artillery and rocket-launch sites around Beijing, the city’s weather engineers will shoot and spray silver iodide and dry ice into incoming clouds that are still far enough away that their rain can be flushed out before they reach the stadium. Modifying the weather may seem a hubristic exercise. But arguably, given what else the Chinese have already invested to make this year’s Olympics a showcase for China’s emergence as a 21st-century superpower, it’s almost the least they could do. Following the announcement in 2001 that the 2008 Games had been awarded to Beijing, the government of the People’s Republic initiated $40 billion of new construction there, bringing 120,000 Chinese migrant workers into the city (at about $130 each a month) and triggering a five-year steel shortage worldwide. Today, Beijing boasts, alongside the vast Bird’s Nest, megastructures like a new airport terminal that on its own is bigger than any airport elsewhere in the world. One measure of the city’s transformation is that today 300 or so new towers, some designed by the most avant-garde architects on the planet, rise where a few short years ago there were only siheyuans (traditional Chinese courtyard residences) interspersed with bland 1950s-era boxes in the Sino-Soviet style. Equally, though, the Geneva-based Centre on Housing Rights and Evictions estimates that 1.5 million of Beijing’s natives will have been displaced from their homes by government edict when the Olympics finally begins. This preemptory modernization is of a piece with China’s scale, its 1.32 billion population, and the authoritarian control exerted by its Communist central government, which nowadays is dominated by technocrats and engineers who favor mega-projects like the world’s largest dam (the Three Gorges dam over the Yangtze River), its highest railway (the Qinghai-Tibet line), and even its biggest Ferris wheel (in Beijing, opening in 2009). 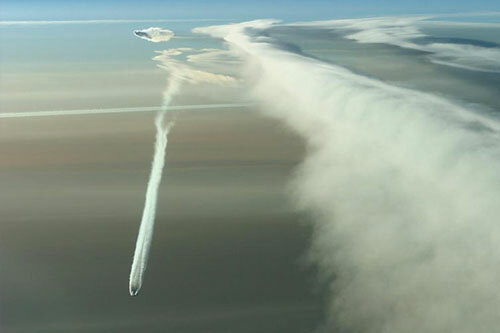 Unsurprisingly, therefore, China’s national weather-engineering program is also the world’s largest, with approximately 1,500 weather modification professionals directing 30 aircraft and their crews, as well as 37,000 part-time workers–mostly peasant farmers–who are on call to blast away at clouds with 7,113 anti-aircraft guns and 4,991 rocket launchers. The Chinese began experimental weather engineering in 1958 to irrigate the country’s north, where average yearly rainfall compares with that during the American Dust Bowl of the 1930s, and sudden windstorms blasting down from the Gobi desert have made drought and famine constant possibilities. Today, the People’s Republic budgets $60 to $90 million annually for its national Weather Modification Office. As for the return on this investment, the state-run news agency Xinhua claims that between 1999 and 2007, the office rendered 470,000 square kilometers of land hail-free and created more than 250 billion tons of rain–an amount sufficient to fill the Yellow River, China’s second largest, four times over. Furthermore, while Qian’s weather engineers in Beijing have been testing their capabilities for the past two years, the Chinese say that during the past five years, similar efforts have already helped produce good weather at national events like the World Expo in Yunnan, the Asian Games in Shanghai, and the Giant Panda Festival in Sichuan. Although they possess the world’s largest weather modification program, the Chinese point to the Russians as being the most advanced. In 1986, Russian scientists deployed cloud-seeding measures to prevent radioactive rain from Chernobyl from reaching Moscow, and in 2000 they cleared clouds before an anniversary ceremony commemorating the end of World War II; China’s then president, Jiang Zemin, witnessed the results firsthand and pushed to adopt the same approach back home. As for the historical credit for starting the whole weather-engineering ball rolling back in 1946, that belongs to employees of General Electric in Schenectady, NY–most notably, scientist Bernard Vonnegut (brother of the late novelist Kurt), who worked out silver iodide’s potential to provide crystals around which cloud moisture would condense. During the 1960s and ’70s, the United States invested millions of federal dollars in experiments like Stormfury (aimed at hurricane control), Skywater (aimed at snow- and rainfall increase), and Skyfire (aimed at lightning suppression). Simultaneously, the U.S. military tried to use weather modification as a weapon in Project Popeye, during the Vietnam War, by rain-making over the Ho Chi Minh Trail in an effort to close it. Still, according to William Cotton, a meteorologist at Colorado State University, “as far as the science of weather modification is concerned, the evidence that it works in certain situations is very compelling.” The Chinese are certainly in no doubt: once they have demonstrated their capabilities to the rest of the world at the Olympics later this year, the party’s central planners intend to expand their national weather modification program in 2010, turning the Weather Modification Office into a separate government ministry that will double the amount of rain-making and other weather engineering that China is now doing.